Nearly three years after introducing its controversial star-based seller-rating system, eBay this week fixed one of the problems with the Detailed Seller Ratings that most troubled sellers: the fact that buyers could still downgrade them based on shipping cost, even if shipping was free. On Tuesday, sellers' DSRs for shipping cost began defaulting to five stars if they offered free shipping. 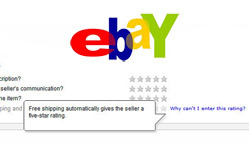 eBay reports the change is not a test, but rather is intended to remain as a permanent policy. The only stipulation is eBay must be able to "verify a buyer did not pay for shipping," according to the company's eBayInk Blog. "Sellers have been asking for this, and we are excited to bring it to them before the holiday season," notes Andrew Chase, blogging for eBayInk. "Free shipping attracts buyers, and this important new protection for sellers will ensure that DSR scores for shipping cost will not receive a score of less than 5 if buyers choose free shipping." To qualify for an automatic 5-star rating, the listing must offer a free shipping option and the buyer must choose the free shipping option during payment. Additionally, sellers must offer a verifiable payment method (meaning, one of eBay's approved electronic payment methods), and use either eBay Checkout or a third-party checkout system that provides full post back information, Chase states. The new initiative aims to declutter search results. Marketplace will accept just one checkout option by July 2011. Sets weekly cap, based on seller performance.